This hashbrown casserole recipe provides plenty of traditional flavor but trims the fat thanks to its reduced-fat cream of celery soup. Spray a casserole dish with cooking spray. Mix potatoes with remaining ingredients. Spread in casserole dish and cover with foil. Bake for 1 hour and 10 minutes. Nutrition Facts (per serving): Calories – 803, Fat – 55.3g, Dietary Fiber – 5.0g, Protein – 18.7g, Vitamin A – 16%, Vitamin C – 15%, Calcium – 41%, Iron – 10%. I made this for a work potluck. I followed the recipe, except I used unsalted butter instead of margarine. I cooked it in the oven in a casserole dish last night for the 1 hour, 10 minutes, then I kept it covered loosely with foil in the fridge overnight. This morning, I cooked it for the remaining 15 minutes uncovered, then moved it to my CrockPot to keep it warm. Wasn’t as gooey as other hashbrown casseroles I’ve had, but still tastes great. May make it for Christmas morning! 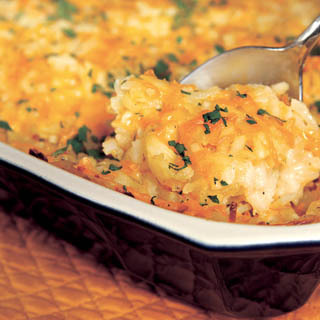 With this recipe, you get all of the yummy goodness of hashbrown casserole without compromising your waistline. I will definitely look forward to having it again. I have made this more than once and it always turns out amazing! Just made this 🙂 with some substitutions. I used butter, and topped with some leftover fried onions and breadcrumbs that I had. I also added in some chicken :). Pretty tasty! A hearty, nutritious casserole, this dish uses any type of potatoes, fresh kale, scallions and two types of cheeses.